There are six distinct organizational paths for entrepreneurs: lifestyle business, small business, scalable startup, buyable startup, large company, and social entrepreneur.All of the individuals who start these organizations are “entrepreneurs” yet not understanding their differences screws up public policy because the ecosystem in supporting each type is radically different. Scalable startups require risk capital to fund their search for a business model, and they attract investment from equally crazy financial investors – venture capitalists. They hire the best and the brightest. Their job is to search for a repeatable and scalable business model. When they find it, their focus on scale requires even more venture capital to fuel rapid expansion. Just in the last few years we’ve come to see that we had been building scalable startups inefficiently. Investors (and educators) treated startups as smaller versions of large companies. We now understand that’s just not true. While large companiesexecute known business models, startups are temporary organizations designed to search for a scalable and repeatable business model. In the last five years, web and mobile app startups that are founded to be sold to larger companies have become popular. The plummeting cost required to build a product, the radically reduced time to bring a product to market and the availability of angel capital willing to invest less than a traditional VCs– $100K – $1M versus $4M on up – has allowed these companies to proliferate – and their investors to make money. Their goal is not to build a billion dollar business, but to be sold to a larger company for $5-$50M. Large companies have finite life cycles. And over the last decade those cycles have grown shorter. Most grow through sustaining innovation, offering new products that are variants around their core products. Changes in customer tastes, new technologies, legislation, new competitors, etc. can create pressure for more disruptive innovation – requiring large companies to create entirely new products sold to new customers in new markets. (i.e. Google and Android.) 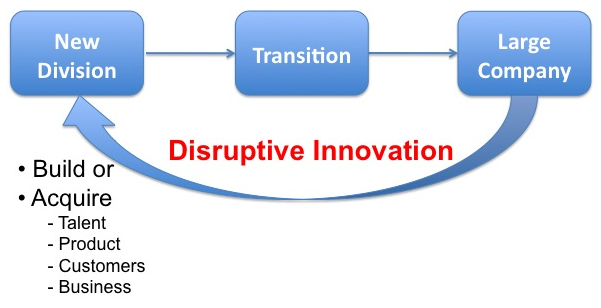 Existing companies do this by either acquiring innovative companies (see Buyable Startups above) or attempting to build a disruptive product internally. Ironically, large company size and culture make disruptive innovation extremely difficult to execute. To date, Israel is only country that has engineered a successful entrepreneurship cluster from the ground up. Its Yozma program kick-started a private venture capital industry with government funds, (emulating the U.S. lesson of using SBIC funds. ), butthen the government got out of the way. I already had a small business and i I heard that Govt. providing maximum opportunities at low cost for MSME (small business). Is it true or not, if so than will u please tell me about this in details and one more thing want to ask, is it the impact of GST? Does governments work the same way all over the world? I could not differentiate the standards in governance of most countries of the world. Either best practices of governance are not adopted by the government or there is lack of efficiency(which must not be the case). Hi, interesting line of reasoning you have. Here in the UK, we’re finding a number of problems. Because property was ranked so high here and now it has been taken away, a gap exists, but it feels more like the government are trying to play by the old limited rules and trying to fix the effects rather than use a creative line of thought to fill the gap the recession has caused. Whereas, flow should be progressive, I believe that in the UK it is becoming regressive instead with outdated entrepreneurial and dare i say ‘Dickension’ methods. It seems more like a conditioned role the government are playing rather than a creative one. With conditioned aspirations stripped away from the masses, there is little being offered to society.